Mattel and the Indy 500 have teamed up to supersize the Hot Wheels V-Drop track you played with as a child. The unreal ramp will facilitate an attempt at the Indianapolis 500 to break the current world record distance jump for a four-wheeled vehicle. The stunt will take place about 80 minutes before the green flag drops on the 100th anniversary running at the Indianapolis Motor Speedway. 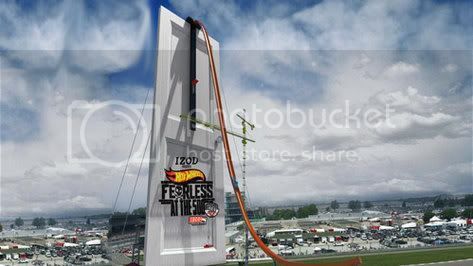 Speeding down a 90 ft. ramp, suspended on a 10-story high door a stunt team will race down the infield at Indianapolis Motor Speedway seeking to break the 302 ft. record. "The essence of this multi-year, multi-platform campaign is all about taking the feelings you experienced when playing with Hot Wheels as a kid and bringing them to real life in full scale," said Simon Waldron, vice president of marketing for Hot Wheels. "By featuring an epic vehicle stunt at this year's centennial anniversary of the Indy 500, we are engaging fans with a jaw-dropping moment in a way that only Hot Wheels can."